Graded-Signal Sexual Swellings as Self-Deception? | Welcome to the EvoS Consortium! 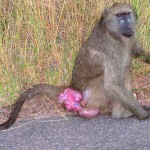 This is probably THEE baboon sexual swelling photo on the internet (from Wikipedia Commons), but it’s still a good one, so there it is. 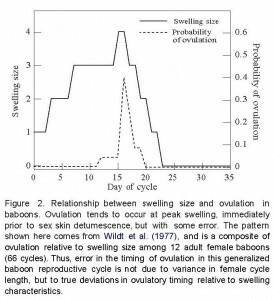 The graded signal hypothesis suggests that sexual swellings in primates represent the probability of ovulation. Based on this model, in male philopatric species, dominant males find it most cost-effective to guard females at the height of ovulation based on the appearance of the swelling. Other males get access outside this period. However, sometimes ovulation & maximum swelling may not always match up, giving lower status males access to ovulating females & passing on asynchronized variation. So what this seems to represent is female exaggeration & possibly self-deception. Do females “think” they’re ovulating? I doubt it, so maybe we should stick with exaggeration. What about in other species? Do signaling non-mammals exaggerate behavior? And why? One explanation might be to loosen up the hold of the philopatric males & further confuse paternity. can effectively bias paternity while also confusing it (i.e. graded-signal hypothesis. Animal Behavior, 58:229-246. This entry was posted in Primates and tagged exaggeration, graded-signal hypothesis, self-deception, sexual swellings. Bookmark the permalink.